Jacksonville, Florida, was the king of the infant film industry. Devastated by fire in 1901, rebuilt in a wide variety of architectural styles, sharing the same geographic and meteorological DNA as southern California, the city was an ideal location for northern film production companies looking to relocate.In 1908, New York-based Kalem Studios sent its first crew to Jacksonville. By 1914, fifteen major companies - including Fox and Metro Pictures - had set up shop there. 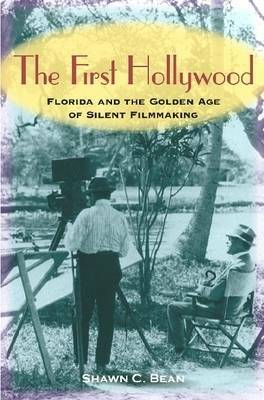 Oliver Hardy, D. W. Griffith, Mary Pickford, and the Barrymores all made movies in the Florida sunshine. In total, nearly 300 films, including the first Technicolor picture ever made, were completed in Jacksonville by 1928.But the city couldn't escape its past. Even as upstart Hollywood boosters sought to discredit Jacksonville, the latter imploded from a combination of political upheaval, simmering racial tensions, disease, and World War I. Shawn Bean uses first-person accounts, filmmaker biographies, newspaper reports, and city and museum archives to bring to light a little-known aspect of film history. Filled with intrigue, backroom shenanigans, and missed opportunities, ""The First Hollywood"" is just the kind of drama we've come to expect from the big screen.There wasn't always just one Tinseltown.